Longwood University’s College of Business and Economics develops students’ global intelligence through its 2012-13 Executive-in-Residence series. Students will learn about global leadership values and ethics from Tonya Mallory (HDL Inc.), Rhonda Vetere (AIG), Robyn Deyo (Barber Martin Agency) and Grace R. den Hartog (Owens & Minor, Inc.). This year's Executives-in-Residence are all superb examples of global leadership values in action. To succeed in today’s global economy requires a well-developed global IQ. With a mission of educating future business leaders, the Longwood College of Business and Economics offers multiple opportunities for students to develop their global intelligence. This includes bringing knowledge and experiential learning about such topics as global leadership values and ethics into the classroom. The 2012-13 Executive-in-Residence series, sponsored by Barrett Capital Management of Richmond, Va., brings four global leaders to campus for a full day of interaction with students and faculty. Tonya Mallory – President and CEO of Health Diagnostic Laboratory Inc., Oct. 3, 2012. Mallory is one of the most promising young intellects in the burgeoning field of laboratory diagnostic testing. She has won several awards for her work including Ernst & Young’s 2012 Greater Washington Entrepreneur of the Year award. Rhonda Vetere – Senior Vice President Global Technology and Infrastructure of AIG, Nov. 8, 2012. An accomplished global IT executive, Vetere specializes in directing worldwide information technology operations ranging from product development and support to organizational restructuring efforts. Robyn Deyo – President and CEO of Barber Martin Agency, Feb. 14, 2013. Originally from Zimbabwe, Deyo worked her way up the ranks at Barber Martin, progressing in 10 years from administrative assistant to president. Under her leadership, the agency has experienced incredible growth and in October 2012 will be recognized by INC magazine as one of the Inc. 500/5000 Fastest Growing Companies in America. Grace R. den Hartog – Senior Vice President, General Counsel and Corporate Secretary of Owens & Minor, Inc., March 12, 2013. A key member of this Fortune 500 company’s leadership team, den Hartog received the Executive Women in Business Achievement Award sponsored by Ernst & Young in 2009. The National Law Journal named her one of America’s top 50 female litigators in 2001. By fostering a dialog with today’s business leaders, the Executive-in-Residence series is just one of the ways that the Longwood University College of Business and Economics prepares students to be successful citizen leaders with the knowledge and skills to advance their careers, their organizations and their communities. To learn more about the 2012-2013 Executive-in-Residence series visit http://www.longwood.edu/business/executive-in-residence.htm. Longwood’s College of Business and Economics, accredited by AACSB International, prepares effective and successful business leaders by guiding students to develop their full potential. A dedication to leadership values and ethics builds on Longwood’s mission to develop citizen leaders. The college’s required and outstanding internship program ensures that all students practice their business skills and apply their knowledge in the real business world. Founded in 1839, Longwood University is one of the oldest public institutions of higher education in the Commonwealth of Virginia. 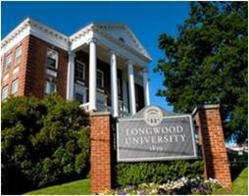 Today, Longwood is a coeducational, comprehensive public institution offering 100 majors, minors and concentrations to more than 4,800 students with undergraduate programs in business administration, education and human services, nursing and the arts and sciences, plus an MBA and other graduate programs in education, communication sciences and disorders, English and sociology. Barrett Capital Management, LLC, headquartered in Richmond, Va., provides fee-only asset management investment services. Its mission is to preserve wealth and generate the best investment results commensurate with each client’s unique risk tolerance and financial goals. The Executive-in-Residence series is made possible through its generous corporate support.